The memory is very clear in my head: I'm 12 and sitting at the little table in my Grandmother's kitchen; the table that was always laden with desserts, fresh fruit for picking a quick snack, and scrumptious breakfast rolls and pastries from the bakery down the street. My cousin is there with me, and we're talking to Grammy Jeanne, immersed in a serious conversation about some current event. My Grandmother is buttering a white soufflé dish liberally, pouring in a mixture of macaroni noodles, ground beef, and tomato sauce and generously sprinkling fresh shredded cheddar over the top. After popping it into the oven, she sits down with us to talk some more. Maybe we don't always agree, but the delicious smells overwhelm kitchen and the conversation is cordial. Right up until her death, my Grammy Jeanne loved talking about news and politics. I can see this picture in my head, and my memory lights up as I remember thinking, in the midst of serious conversation, I can't wait until dinnertime. And then I flash to another memory: Coming home on a cold Fall day from who-knows-where. Maybe riding my bike, or roller skating on the street. I come to the backdoor and before I even open it I inhale and close my eyes. Onions sautéing in butter. Ground beef dusted with garlic powder. Cheese, tangy tomato sauce. My Mother is making Johnny Marzetti, working from the recipe her Mother had written out for her after she had gotten married. Both of these memories are so strong and speak of comfort and love. And yet, when I mention Johnny Marzetti to most people, it's almost always responded to with a confused, "Johnny Marzetti, what's that?" When I explain it to them, they often correct me and say it's Goulash (it's not), glorified Hamburger Helper (Heaven forbid), or want to know why it's called Johnny Marzetti. Up until this week, I had no idea why it was called that, and how it came into existence. Well now, dear readers, I have the answer. The year is 1896, and Marzetti's, a restaurant in Columbus, Ohio has just been opened by Teresa Marzetti, an Italian immigrant. Since Marzetti's is very close Ohio State University, it's often frequented by hungry young men looking for good, filling comfort food that reminds them of home. 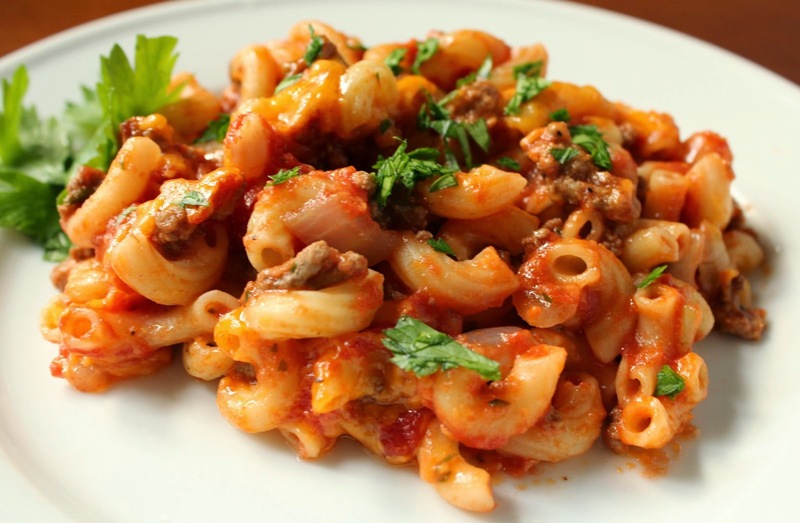 Realizing that these starving students also need a meal to fill up on that's cheap, Teresa concocts a dish that uses ground beef, cheddar cheese, tomato sauce, and elbow macaroni noodles. She names it "Johnny Marzetti" for her brother-in-law, Johnny, and sells it for ¢45. The dish becomes wildly popular, and by the 1920s has spread like wildfire across the Midwest (it's also the national dish in Panama - thanks to soldiers during WWII eating so much of it - but made with olives and Arturo sauce). "Why after her brother-in-law?" My Mom asks me over the phone as we talk about how this dish got its start in our family. After all, my Mom's family is from South Jersey, not the Midwest. "Why not her actual brother, or her husband?" I don't have an answer for this, but in my head I imagine that Johnny the brother-in-law loves this dish so much he eats his weight in it, and much like me, has a reverence for it that becomes something akin to devotion; a desire so strong for this simple dish that nothing can comfort him but this. Forget your eggplant parmesan, your spaghetti, your alfredos. This dish is the pinnacle of his culinary love. So much so that Teresa is forced to say, "Wow. He likes it so much, I should probably name it after him." 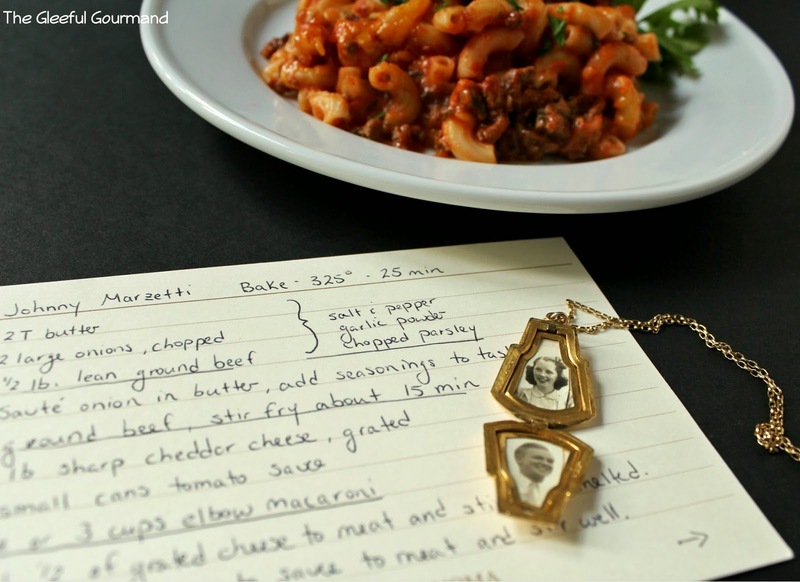 My Grandmother's recipe that I wrote out exactly as she had written, and her locket. That's her and my Grandfather. Anyway, that's the story I tell myself. My Mom vaguely remembers eating Johnny Marzetti in high school, which would have been in the early 1960s. But she has no idea how Grammy Jeanne came across the recipe in the first place. Was it a magazine or newspaper article? Had a friend or family member passed it along to her at some point? That part of the story is lost, but the point is, Johnny Marzetti became a family favorite, and it's still a family favorite today in our home. Not only is it ridiculously easy to make, but it's kid-friendly and delicious. My kids can be picky at times, but not when it comes to Johnny Marzetti. I can casually mention the name and it will be met with screams, claps, and lots of jumping up and down. I'm not exaggerating. You know it's good because their faces are covered with it. And yes, I realize that you could hustle your little self to the store and buy a box of Hamburger Helper, and it would be much the same, except that it wouldn't be, at all. I like picking out the freshest ingredients. I like knowing what noodles I'm using, and real cheese (extra sharp is best). I love sprinkling fresh parsley into it. No, it's not a healthy dish, but I like creating it all on my own. • Sauté onion in 1 Tbsp. butter, add seasonings to taste, and ground beef. Stir fry for about 15 minutes. • Boil noodles in salted water, drain, toss with the other tablespoon of butter. • Add 1/2 of the grated cheese to the meat and onions and stir until melted. • Add one can of tomato sauce to the meat mixture and stir well. • Add the noodles to the meat mixture and blend. Place in 2 buttered casseroles. Cover each one with 1 can of sauce. Divide the remaining cheese over the top of each. • Bake one of the casseroles at 325˚ for 25 minutes and cover the other casserole with Saran and aluminum foil and freeze for later. I typically use 1 large sweet vidalia onion. I also use way more cheese on top of the casserole that's going into the oven, and leave the one going in the freezer cheese-less. I like having freshly grated cheese on the dish. Instead of buttering the dishes (2 8x8 pans, or one 9 x 13 if you're feeding a crowd), I like to spoon a bit of tomato sauce evenly on the bottom instead. Not only does it add flavor, but the Marzetti comes out just as easily. Jenna, I love your story about this dish and your grandmother. How well I remember her kitchen, her lethal desserts, and her love of conversation around the kitchen table. Yes, she was interested in everything and everyone, accompanied by something good to eat. If that's the locket she kept with a photo of herself and John, I'm beginning to weep. Mimi, thank you so much. Yes, that's her locket and I am so thankful to have it. It's so precious to me, just as she and Papa John were. 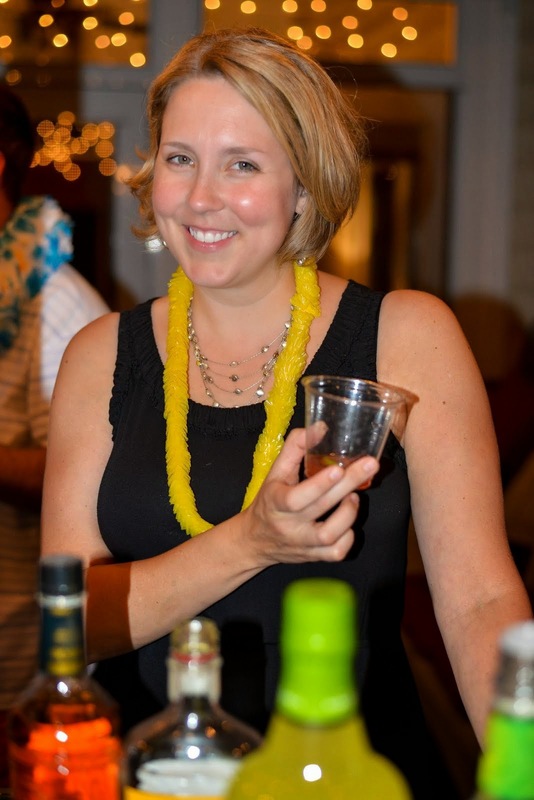 I've often wanted to write about her and her entertaining style and her love for good food and what a gourmet she really was (hello half splits of champagne!). I haven't been able to yet, but hopefully soon. This sounds delicious. I will certainly try the recipe. Hope to read more about your Grammy Jeanne. You will not be disappointed! Let me know how it turns out. Oh gosh I'm drooling here. I love pasta! Thanks SuperLux! I hope you give it a try and let me know how it turns out! So that's what this is called! 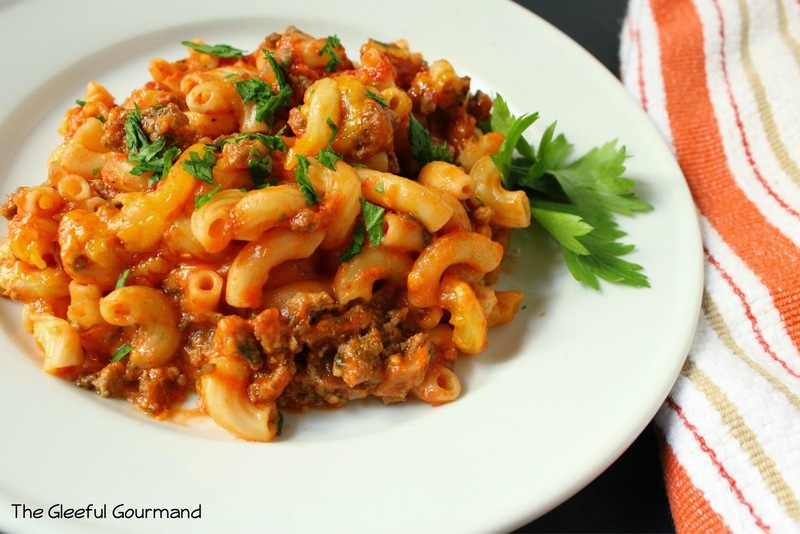 In my house it was always "Chopmeat and Macaroni" growing up, with the occasional "American Goulash." By far one of my favorite comfort foods...so many good memories wrapped up in this one dish! Although now that I'm vegetarian, it's not *quite* the same. I love that, Deobrah! "Chopmeat and Macaroni." That's kind of hilarious. Just out of curiosity, which part of the country are you in? I'm interested to know how the name has changed from region to region. Also, do you actually make substitutions for the ground beef now that you're a vegetarian?